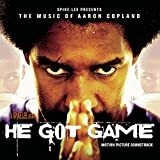 Accueil Produits Bande originale La bande originale de “He got game”. La bande originale de “He got game”. Label : Def Jam / Sony Masterworks. Sortie : 28 avril 1998 / 21 avril 1998. Film : He got game. Le film comporte deux albums : l’un avec des chansons, l’autre avec les musiques présentes dans le long-métrage. Resurrection (par Public Enemy et Masta Killa) – 4:20. 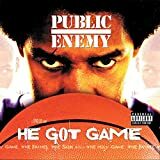 He Got Game (par Public Enemy et Stephen Stills) – 4:46. Unstoppable (par Public Enemy et KRS-One) – 3:14. Shake Your Booty (par Flavor Flav) – 3:45. Is Your God A Dog (par Public Enemy) – 5:08. House Of Rising Sun (par Public Enemy) – 3:16. Revelation 33 1/3 Revolutions (par Public Enemy) – 4:11. Game Face (par Public Enemy) – 3:17. Politics Of The Sneaker Pimps (par Public Enemy) – 3:16. What You Need Is Jesus (par Public Enemy) – 3:29. Go Cat Go (par Public Enemy) – 3:48. Sudden Death (Interlude) (par Public Enemy) – 2:04. Super Agent (par Public Enemy) – 3:35. Appalachian Spring (Very Slowly) – 2:45. Appalachian Spring (Calm and Flowing) [Shaker melody: Simple Gifts] – 3:11. Appalachian Spring (Moderato. Coda) – 3:23. Rodeo (Four Dance Episodes) [Hoe-down] – 3:31. Lincoln Portrait (Orchestral Version Without Narration) – 15:05. Music for the Theatre (Interlude) – 5:21. Fanfare for the Common Man – 3:14. Dance Panels (Ballet in Seven Sections) [Pas de Trois: Lento] – 4:02. Letter from Home – 7:22. Grover’s Corner from “Our Town” (From Music for Movies) – 3:10. Billy the Kid (Orchestral Suite) [The Open Prairie] – 3:21. Billy the Kid (Orchestral Suite) [The Open Prairie Again] – 1:45.